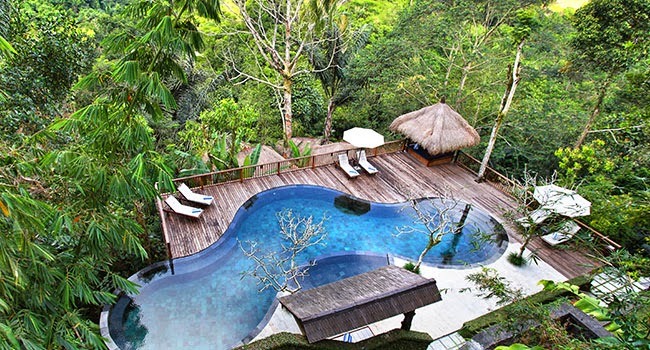 Set deep within a beautiful jungle, with stunning views across the valley, the Nandini Bali Jungle Resort and Spa offers a truly luxurious experience in a pure and natural environment. 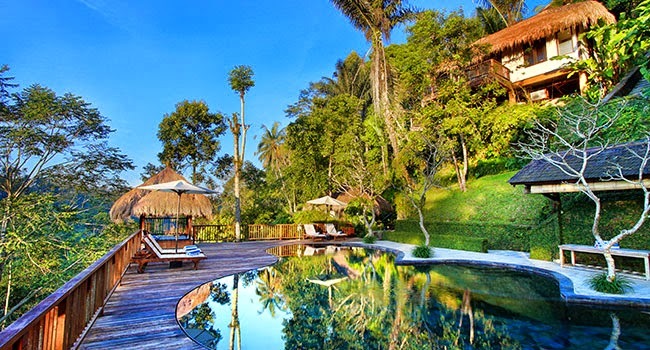 From the moment you arrive at this luxury spa resort you can immerse yourself in the beauty of this calm oasis, taking in the incredible sights and gentle sounds of the forest below and breathing in the fresh mountain air. 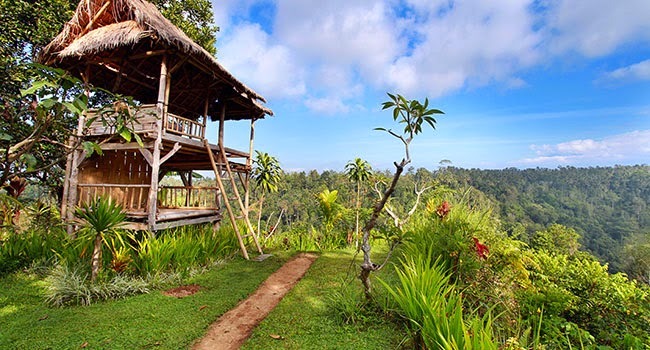 Find a luxury hidden among the rice terraces and banana groves, as you head to your secluded home. Simply constructed from natural materials, each villa containing everything you would expect from a luxury holiday in Bali. Whether enjoying uninterrupted views from your luxury villa, taking in the sights from the incredible hillside pool, relaxing at the spa, or simply wandering through the winding paths, take a break from the rest of the world at Nandini Bali Jungle Resort and Spa.We are pleased to welcome you to our relaxing facilities and to introduce to a world of discovery and a sheer indulgence of the senses. 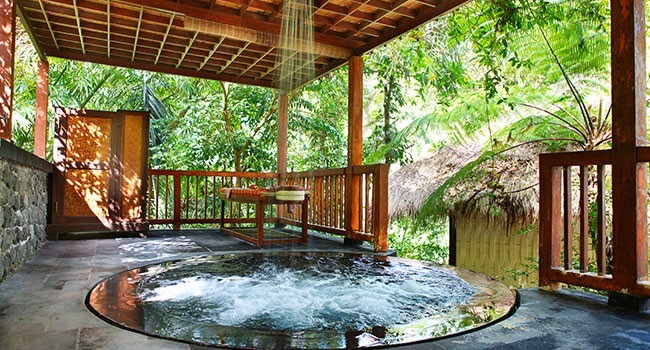 Immersed yourself in an alluring warm bath surrounded by sweet smelling tropical flowers. 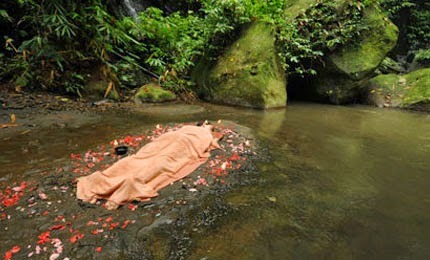 Listen to the natural background sounds of nature, birds and river in the jungle surrounding our Spa and be drifted away into total relaxation and bliss. 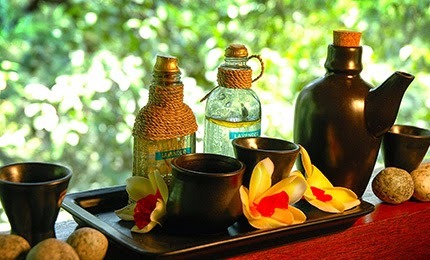 Traditional Balinese herbal tea will be served after our Spa treatments. Experience a total relaxing, enjoyable and memorable time with your loved one at Sungai Spa. 1 hour Balinese Massage, Balinese Boreh Body Scrub, Papaya Body Mask and Exotic Flower Bath.This traditional herbal therapy handed down many generations for relieving muscular aches, increasing circulation and warming the skin and body. Boreh accomplishes this by using heat therapy combined with Bali traditional herbs and spices. 1 hour Balinese Massage, Javanese Lulur Body Scrub, Nourishing Milk Mask and Exotic Flower Bath.This is an ancient beauty treatment which originated centuries ago in the palaces of central Java as a purifying ritual for Javanese princesses as they prepared for their wedding. 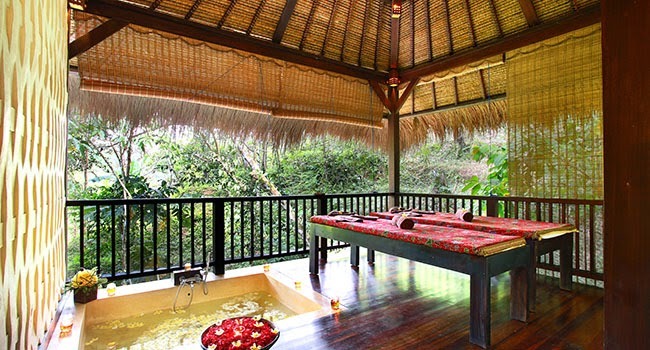 The treatment begins with a ritual foot scrub followed with a Balinese massage. Continuing this is an application of aromatic Javanese Lulur followed with nourishing milk splashed and lightly massaged over the body. Complete this blissful treat with a warm aromatic flower bath. 1 hour Body Massage, Green Tea Body Scrub, Green Tea Body Mask, Exotic Flower Bath and Detox Juice.Loaded with powerful antioxidants, green tea has many healing and preventative properties to fight free radicals and protect cells from environmental damage. This treatment includes fresh anti-oxidant and detoxifying juice of green apple, carrot and celery to boost your immune system. 1.5 hour Body Massage, Sensual Body Scrub, Sensual Body Mask and Exotic Flower Bath.An Indonesian indigenous formula for love, this sweet aphrodisiac blend of rose, jasmine, Kananga and sandalwood oils with exfoliating rice extracts is very effective in releasing physical and emotional tension, sedating the spirit. An amorously sensual treat. 1.5 hour Body Massage, Contouring Body Scrub, Contouring Body Mask and Exotic Flower Bath.Patchoulli and lemon oil with rice extract are well known to be cogent in combating cellulite and stimulating cellular regeneration. This special treatment will help the body to eliminate toxins, tone the skin and revitalize the mind. 1.5 hour Body Massage, Reviving Body Scrub, Reviving Body Mask and Exotic Flower Bath.The essential blends of peppermint and lemon is both refreshing and reinvigorating treat for the tired and jet-lagged body and mind, which will bring you back into harmony and balance.